Coastal forests are found along the coast and are subject to a maritime climate. These forests do not receive daily salt spray (as a true maritime forest may), but can be subject to wind and salt spray during storm events. Oak trees, particularly black, white, chestnut and scarlet, are the dominant trees of these forests. Other trees that may be intermixed with the oaks include black cherry, sassafras, red maple, beech, tupelo, white pine and pitch pine. 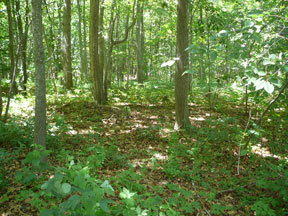 Low lying shrubs such as low bush blueberries and black huckleberry. Vines are very characteristic of coastal forest edges and openings including Virginia creeper, poison ivy, grape and greenbriers. Due to intense agricultural and development pressures, Connecticut has very little forest left within the coastal zone. What is left is often heavily browsed by deer and invaded by non-native species. Raising awareness of where and what these forests are will aid in protection and restoration efforts. For more detailed information download Coastal Forests & Woodlands (PDF).